Is SWOLF (or "Swim Golf") Really A True Measure Of Efficiency? ~ Feel For The Water! Advice & Tips to Improve Your Swimming. Home » » Is SWOLF (or "Swim Golf") Really A True Measure Of Efficiency? Is SWOLF (or "Swim Golf") Really A True Measure Of Efficiency? If you own a piece of wearable swimming technology like a swim watch, or have attended a master's or triathlon squad technique session, chances are you'll have come across the term SWOLF. You might have even wondered: What is this strange score that I get after each swim? How is it helping me become a better swimmer? How do you think the SWOLF of these two swimmers compares? What is SWOLF and what does it mean for me? SWOLF is a portmanteau, or blending of the terms Swimming and Golf. The SWOLF score is a measure of your swimming efficiency, and just as in golf, a lower score is better. Your SWOLF score is simply your swim time in seconds per length added to the number of strokes you took to complete that length. For example, if you swim a 25m length in 25 seconds and take 25 strokes, you would have a SWOLF score of 50. Someone else might cover that same distance in 22 seconds and take 28 strokes. Both swimmers would thus receive a score of 50 (equal "efficiency") but is the first swimmer really as efficient as the second if they take 12 seconds longer to complete each 100m interval? Is SWOLF really the best measure of efficiency for you to be tracking? Given its prevalence as a metric across a range of products, programs and swimming literature, and knowing our own penchant for stroke analysis, you might have also wondered why Swim Smooth never refer to SWOLF. It's certainly one of the most requested topics for future blogs that we receive from our loyal followers around the world. Let's first go back in time. Way back. Coaches used to state that to be as efficient as possible, you had to take as few strokes as possible to complete each length. Covering a certain distance in fewer strokes was purportedly a sign of enhanced efficiency. The idea seemed sound enough - cover a greater distance per stroke (DPS) and you were purportedly using less effort. Swimming is a cyclical sport like cycling and running and yet you'd never suggest that pushing a bigger gear on your bike or extending your run stride as far as you possibly can would make you more efficient. Yet this was the common belief in swimming at the time (and something that some still cling on to in swimming today). So prevalent was this belief that even today, the latest technology still utilises minimum strokes as one of the two key components to ascertain a "score" for efficiency. Should we then just take it as read that this is what we should be monitoring above all else and even using it to compare elite athletes? We are sure that every coach out there is motivated by one thing and one thing only - to help others improve. It's certainly the reason why we - as Swim Smooth coaches - got into coaching and are still as passionate about it today as we were 13 years ago. Irrespective of whichever coach or program you follow, as different and conflicting as they might appear, they will have this basic desire to help others improve at the heart and soul of what they do. It's the driver behind what we all do as coaches and as anyone interested in the sport. However, it's also the reason that we don't hesitate to challenge the status quo if all the logic dots don't quite line up properly, especially if it means you fast-track your own education about what will likely work best for you. Call to action: if you do know someone who still believes swimmers should take as few strokes as possible, or even coaches this way, kindly point them towards this article. Chances are they just haven't ever questioned what was told to them by their own coach. Helen Skelton: There's a huge difference in technique though isn't there? 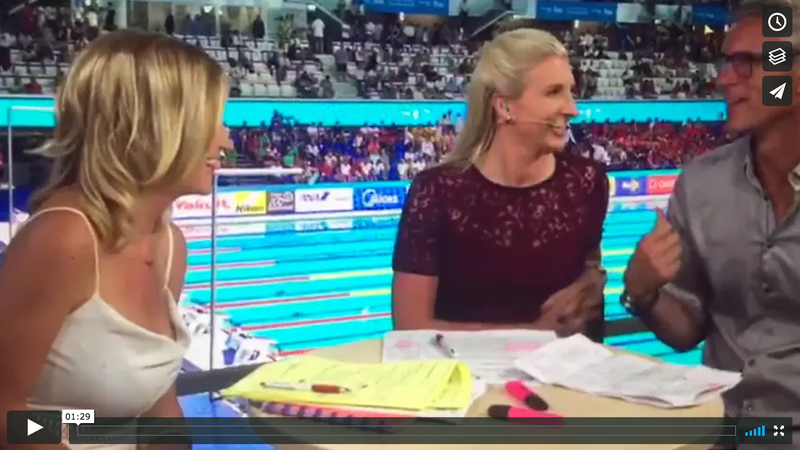 Rebecca Adlington: Paltrinieri probably realises I'm never going to be good at underwater, I'm never going to be good at streamlining so he's trying to use other things to his advantage. A classic example of how the measure of strokes per length is still utilised in swimming circles as the go to measure of efficiency and as such you'd be forgiven for thinking that it is still the holy grail. As we are about to find out though, that's not entirely true, and in many cases, simply wrong and very misleading, especially if you aren't blessed with the physique of a swimming legend like Michael Phelps. Ironically enough, even those with god-like physiques will benefit well from this discussion too - doing so is what is allowing the likes of Katie Ledecky (multiple Olympic Champion and World Record holder), Gregorio Paltrinieri (current Olympic and World Champion) and Adam Peaty (Olympic and World Champion and World Record holder) set new benchmarks at the very highest level. You can begin to understand where this well meaning advice comes from when you consider that counting your strokes per length is an easy metric to measure - you don't need a stopwatch, or a coach, you just need to count every right / left hand entry into the water. Simple. For this very reason, coaches around the world used to (and in some cases still do) get their swimmers to count how many strokes they have taken, often rewarding and praising those with the lowest counts as the most efficient, despite the range of heights, builds and wingspans typically present in a squad session. How could it ever have been seen to be a logical consideration when such anthropometric variation exists naturally in society? 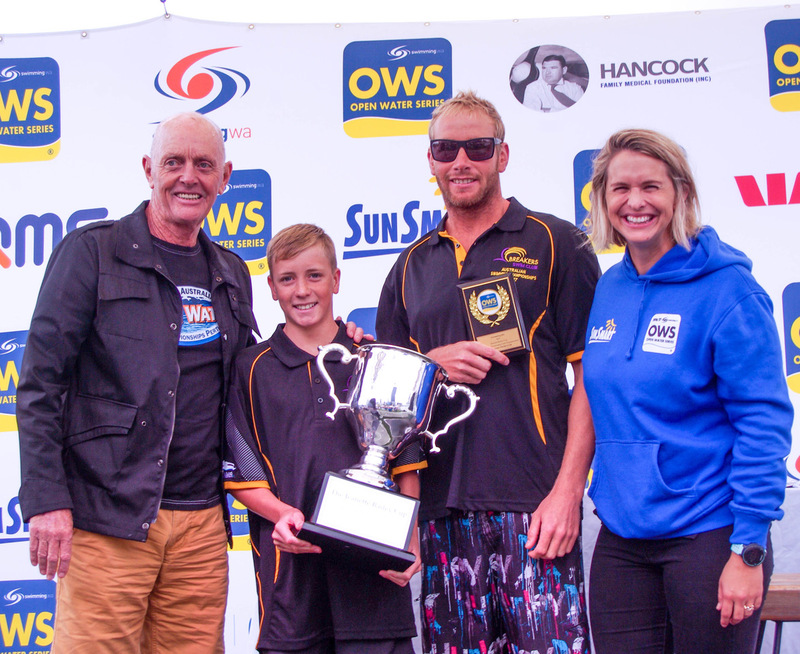 Both Brad and Byron are two of Australia's top aspiring marathon swimmers. 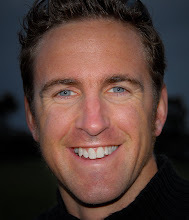 Brad, 27, holds the world record for the 25km Port-to-Pub swim in a time of 5h34m (or 1:20/100m average pace), which for a non-drafting solo effort is pretty remarkable - most people wouldn't be able to stay with Brad for the first 100m of his continuous 250 x 100m race! Even Australian Olympic representative, and famed Rio 2016 10km open water breakaway Jarrod Poort failed to beat Brad's time this year. Byron, at the tender age of 15, is exactly half the weight of Brad and a full foot (27cm) shorter than him, and yet is the fastest distance swimmer we've ever had in the program. With a CSS of 1:06/100, this pocket rocket finished 5th at the national 5km open water swimming championships here in Australia, and has a hugely bright future ahead of him. During a 5500m training session, Byron is between 600 and 800m ahead of our next best swimmers in the fast lane! Both Brad and Byron swim in our infamous Wednesday morning Red Mist Endurance session. When you watch Byron and Brad swimming side by side the obvious difference is their stroke rate (cadence) with Brad sitting around 59 SPM and Bryon revving at 90 SPM. Exactly as you'd expect given the difference in their height and builds. At their respective CSS paces (very similar) Brad typically takes 32 to 33 strokes per 50m length and Byron 49 to 51 strokes. If you work out the SWOLF score for each, Brad is 66 to 67 and Byron 83 to 85 - does this really imply that Brad is over 20% more efficient than Byron? Of course not. The key point here is that there's more than one way to swim efficiently and one has a higher SWOLF score than the other. Brad shouldn't swim like Byron and Byron shouldn't swim like Brad and at Swim Smooth we'd never suggest that they do. If you've been following Swim Smooth for a while, much of the above will come as no surprise to you. We've spent the last 13 years warning of the dangers of overly lengthening your stroke by adding a pause and glide to artificially lower your stroke count. We refer to this simply as "Overgliding" and at one point in the 1990s this style of swimming was at almost epidemic proportions. At least SWOLF takes into account time per length as well, but as we've seen, even that throws up spurious results too. Here at Swim Smooth we love our raw, unfiltered data and are massive fans of the Tritonwear Team and the brilliant data they make available for anyone interested in how the world's very best (and most efficient) swimmers swim. Between them, these swimmers own 7 Olympic Gold medals and 5 World Records. 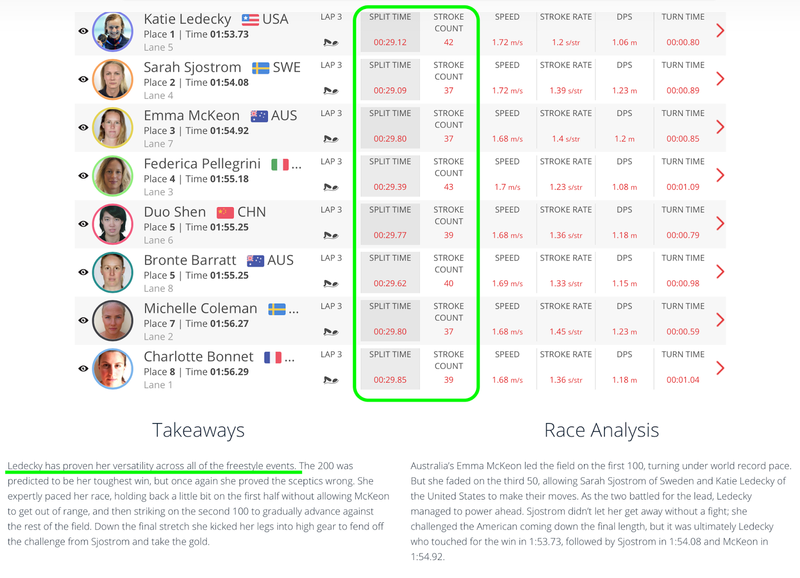 Katie Ledecky has the highest SWOLF score (i.e. least "efficient") of the top-3 podium finishers by a count of 5, only the 2017 200m freestyle champion Federica Pelligrini has anywhere near this level of "inefficiency" within the women's field. The phenomenon that is Adam Peaty, purportedly so much less efficient than everyone he's dominating (if we are to believe the SWOLF metric) - this race was voted by FINA as the best swim of the entire 2016 Olympic Games. Mock him though they might, Gregorio Paltrinieri's "inelegant stroke" has now won him the two highest accolades in the sport in less than 12 months. Good job his coach, Stefano Morini, looks well beyond the aesthetics to find out what is truly efficient for him. 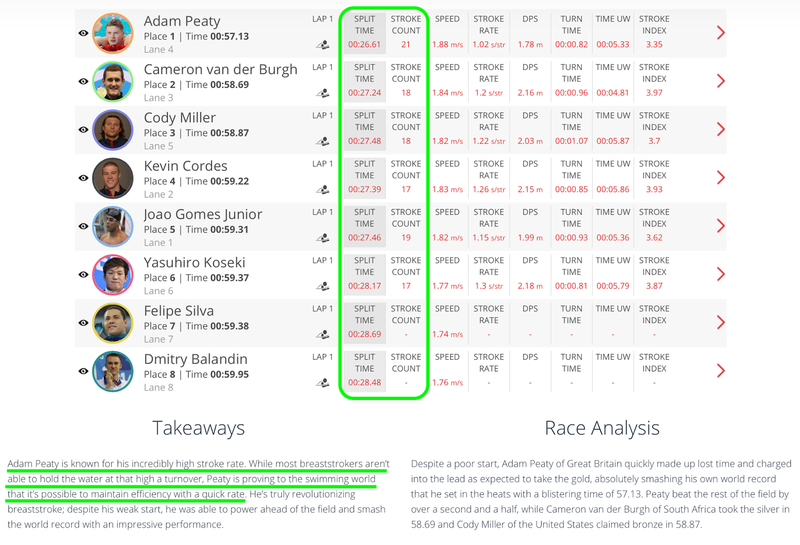 Ledecky: "is versatile across all freestyle events"
Paltrinieri: "hardly kicks to conserve energy"
Peaty: "proves to the world it's possible to maintain efficiency with a quick rate"
These points are all very valid simply because the data, and the ultimate result for each swimmer, shows us that they are factual. What is interesting is how they are all in opposition to the view that a low SWOLF score gives the most efficient stroke. Of course people will argue and claim that having a more efficient stroke does not mean one swimmer will be faster than another, just that they will input less energy for a similar output. However, at the very highest level of the sport, all that matters is who crosses the line first. Forgive us for cherry-picking the data from the Tritonwear Team's data set to demonstrate and support the findings above. Do our suggestions actually suggest an inverse relationship between a low SWOLF score and performance? Possibly. However, looking across the whole range of swims in Rio, if full statistics were run on every event we believe that this measure of so-called “efficiency” would prove to be simply “non-significant” in either direction. That makes sense when you think about it - there are "horses for courses" and "more than one way to skin the efficiency cat" as even at the very pointy end of athletic performance there is extreme variability in body morphology and physiology allowing for such a range in data. Acknowledgement of this and embracing people's individuality is at the heart of what our own Swim Types system is all about - be the most efficient you can be given your height, build, gender, ability level and discipline. 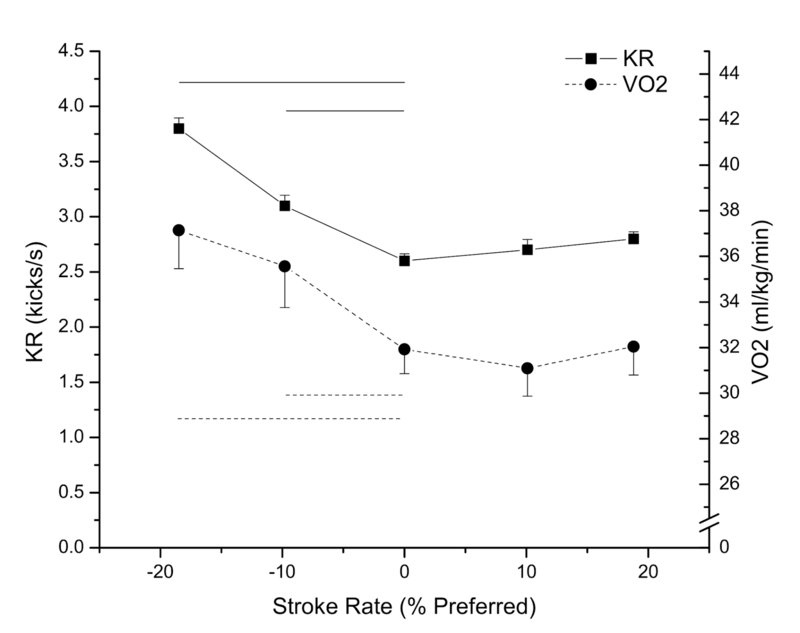 In 2010, a study in Texas by McLean et al  on oxygen uptake in response to stroke rate manipulation in freestyle swimming showed that heart rate and oxygen consumption increased as stroke rate was reduced and stroke length increased to maintain a given speed. - Ignore SWOLF, do what the world's best male (Paltrinieri) and female (Ledecky) distance swimmers do which is trade-off some stroke length for a quicker turnover. This maintains rhythm and momentum, and so reduces energy expenditure from a strong kick until much later in the event. - You seek out the lowest possible SWOLF score and come second, third or last. And that, faithful reader, is why we never use SWOLF as a valid and reliable discussion point for efficiency. The conclusions here are clear. SWOLF is an extremely poor way to compare one swimmer's efficiency to another - either at the elite or age-group level. You might choose to use SWOLF as a way of tracking your stroke development over time but be very wary that a lower SWOLF score doesn't necessarily mean better swimming. In fact you can easily go down a cul-de-sac with your stroke and become less efficient by chasing a lower SWOLF score. Like Mark Foster says in the video above, there are many factors at play here which need to be considered, many of which are not easily measured. So the next time your well meaning coach asks you to reduce your stroke count to match Jim who's six inches taller than you, please be wary and kindly point them to this article. If Not SWOLF The How Should I Monitor My Swimming Efficiency? What you are really looking for as you develop your swimming is the best way for you to swim as an individual. This has you swimming with a Tempo Trainer Pro to control your stroke rate, covering a range of cadences from slow to fast. At each we assess your speed and perceived effort to get a sense of your efficiency through the water. You will find that you have "sweet spots" in your stroke where everything clicks and you suddenly pick up speed for little or no increase in effort. Normally these sweet spots are in the middle of your cadence range, not when you are using an especially fast or slow stroke rate. McLean SP, Palmer D, Ice G, Truijens M, Smith JC. (2010). 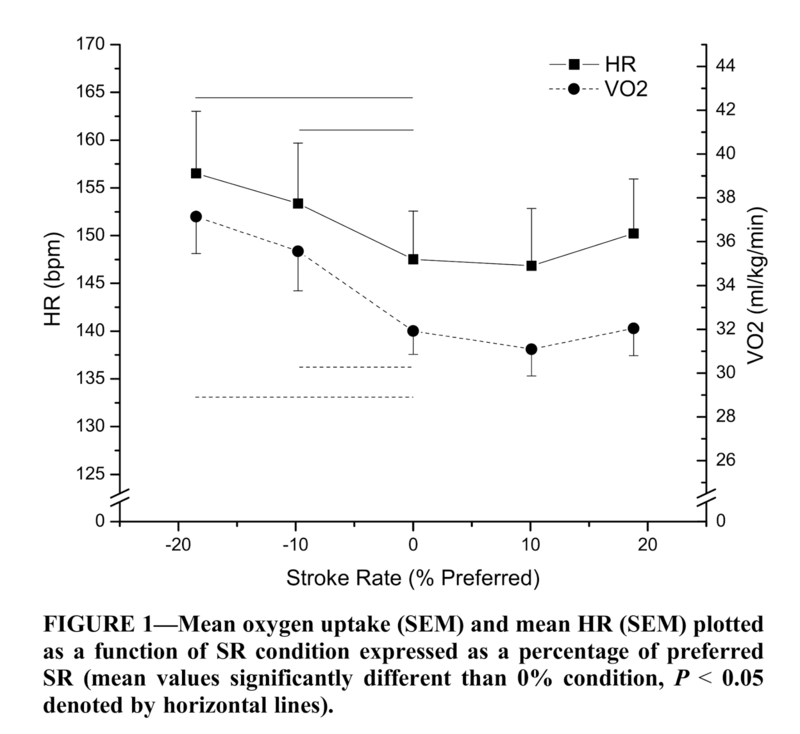 Oxygen uptake response to stroke rate manipulation in freestyle swimming. Med Sci Sports Exerc., 42(10):1909-13. The ability of sports coaching to ignore decades old science is endlessly remarkable. I didn't realise it would be that old though. My personal bug-bear (not coaching, but public policy) is red rear lights on bicycles & the expectation they can be seen in people's peripheries; we've known for almost as long as the book you quote that human eyes can't see red in the peripheries of vision....& red reflectors....& red gillets...Aaaarrrrrgggggghhhh!!! My current favourite is running 'power meters': they clearly ignore the law of conservation of energy - how old is that law? That predates Galileo! Now that would be a challenge; find a 'law' of swimming that is rebuked by science originating before Galileo! Brilliant post, Paul, thank you. The section on oxygen uptake/physical demands of artificially lengthening stroke was completely new to me, and the whole piece is a very cogent explanation. I've forwarded it to my still-stroke-counting (without even reference to time) fellow coaches at my club, who have been driving me mad by spending months talking to the swimmers about stroke count. Whether they take note or not is a different question: entrenched views die hard. 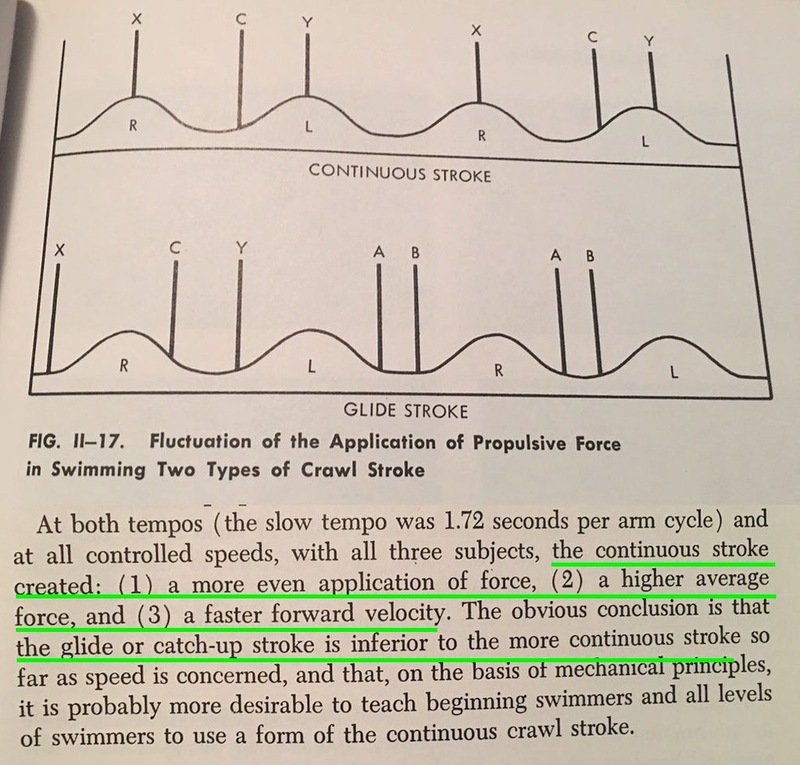 Thanks, I've wondered why my coaches sometimes ask for a lower stroke count in some workouts and this answers my questions. On another trivial "pet peeve" note, you make a reference to "THE Ukraine". Your country isn't known as "THE Australia", and neither is it THE Ethiopia, THE Ireland, THE Oman, THE Uganda, or any other country whose name begins with a vowel. It is just, Ukraine. Please be mindful of this in the future. Hi John, we stand corrected! Very nice post, Paul! In fact swolf definitly it is not the best way to validate performances. We've got Kattie Ledeck, Paltinieri, in one side, and, for example Usain Bolt, in the other side. He shocked the world up-siding-down the rules of 100m/200m sprinting. He's taller, heavier and cracked the 100/200m WR with a low "SWOLF" - covering the 100/200m distances with significant less steps over your concorrents . He's not a long distance runner and the main energetic system resource is completely different from endurance athletes, ok, but he cracked down a myth that small and ultra high speed legs sprinters would be more fitted for those kind of races. Engaging and powerful essay, as always, Paul. 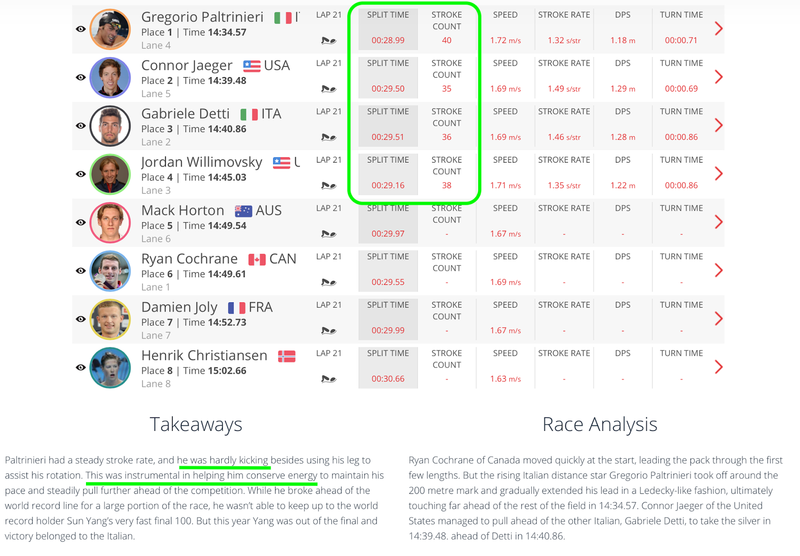 Appreciate the credit you give to TritonWear for compiling metrics from all that race footage. I only wish TritonWear made their trackers available for sale to individuals. I loved your email on swolf and it contained a lot of information I wasn't aware of. However as a coach we play this game occasionally and usually the squad enjoy it. It's a bit of fun. I honestly see no harm in encouraging swimmers to be aware of their stroke count and the relationship between stroke count and speed. I would say that comparing your stroke count to someone else's is of no use but encouraging a swimmer to maintain a stroke count while increasing speed is. There has to be value in encouraging a swimmer to work on technique and be aware if it affects their stroke count. I know that when a swimmers technique improves and their stroke count drops this is highly motivational. I agree with you that too much or over emphasis of stroke count isn't useful but used correctly everything has value. "encouraging a swimmer to maintain a stroke count while increasing speed is." Thanks Anonymous, our thoughts also - what is your background out of interest? Coach? Swimmer? Science / engineering? Before 2 years ago, I had an advanced degree in couch-potato-ism and no formal swimming background and today I swim almost every day and average about a mile (1,600 meters) per day. My average 1,000 meter time is about 21 minutes and while that's not exactly fast, I think it is respectable for a 60 year old former couch potato that began swimming for fitness about 2 years ago! In case you are wondering what spurred me on to start swimming for fitness at the age of 58 - it was my quadruple coronary angioplasty and stent placement. About a month after it, I asked my Cardiologist if I would exercise. He let me so I started swimming. That's great to hear Michael that you got up off that couch and started swimming! Well done! I do hope you, your family, and your friends are safe and sound after Irma! Thank you Paul. Indeed all are safe and sound... and now that electric power has been restored locally, they are cool (A/C) too! ;-) Thanx again for all you do for us "swimmers for cake"! Glad all is well for you in Florida and the power is back on. We have relocated back to Houston after a lovely 5 1/2 years in Perth, Australia so we just went through Harvey. Luckily our home did not flood. The thing is that the Swolf doesn´t serve to compare different swimmers, but yes for the same swimmer. If I have swim 25 m in 20 strokes and in the following 25 m in 18 strokes with equal or better time that means that I have been more efficient. Someone have been named a big swimmers as Ledecky whose SPM is higher than others, but most efficient doesn´t mean that you should be more fast.